So, you know those silly “candy grams” that are used for every occasion under the sun? Well, I think they should find their place in our relationships more often... They are simple, cheap, and fun! 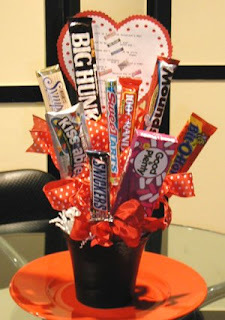 How about this Candy-Gram bouquet? 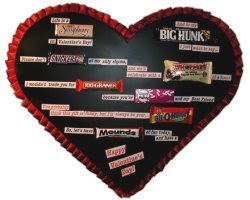 If piecing together a poem isn't your thing, simply using phrases for each candy works, too! Adapt for the working spouse, student, SAHD (stay-at-home-dad), or for any holiday. "Happy Anniversary, SWEETTART! Seven years gone by, and you are still my RIESEN for living. I really SKOR-ed by marrying you! We’ve traveled some ROCKY ROADs, but I wouldn’t trade our life together for 100 GRAND. I’m still RED HOT for you! We’ve shared GOOD AND PLENTY of SNICKERS…and those are times that I will TREASURE forever. I love that I can still ROLO-ver next to you each morning and see my SUGAR DADDY. HUGS & KISSES, Your SUGAR BABY"
The Executive Homemaker has other brilliant ideas for candy-or-other-small-object grams! Those are really neat and will have to try to make one! Candy grams are a wonderful favorite. Great ideas!! I'm from the SITS Welcome Wagon! I've been a member since it's beginning, and I've met so many amazing women and read so many fun blogs. I'm so glad you've joined us, SITSta! i did a candy gram to announce to my hubby we were expecting our second baby... love the ideas! thanks! I made quite a few of those for Valentines. They were perfect for all of my daughters friends and her teachers. great ideas! thanks for visiting us!